Decorating a small bathroom is always a pain, but for most people it means choosing the difference between a vanity that’s either 24″, 30″, or 36″ wide. But in really, truly small spaces – like long, narrow half baths – you not only have to worry about how wide your vanity is, but also how far it extends away from the wall. Most conventional “small” bathroom vanities are big enough to disrupt movement in these teeny tiny bathrooms, which means you need a more elegant solution. 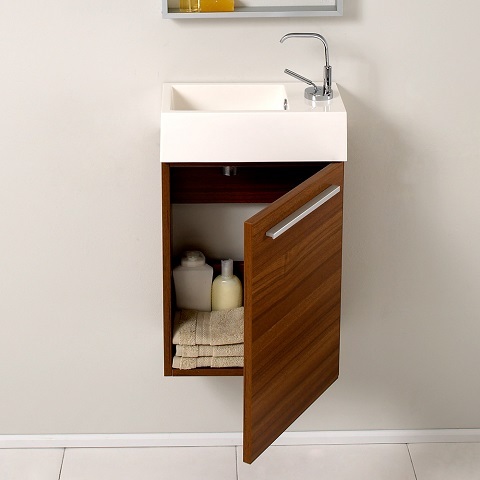 Modern space saving vanities are both narrow and sit close to the wall, making them an ideal option for extremely small spaces. Most typical small bathroom vanities are sort of squarish, with your average “very small” wall mounted vanity clocking in at about 24″ wide and equally tall, and about 20″ deep. These have a nice, trim appearance that works pretty well in a small space. But if the problem with your bathroom isn’t the amount of wall space you have, but the narrowness of your walkways, that 18″-22″ vanity depth can really start to crowd you. 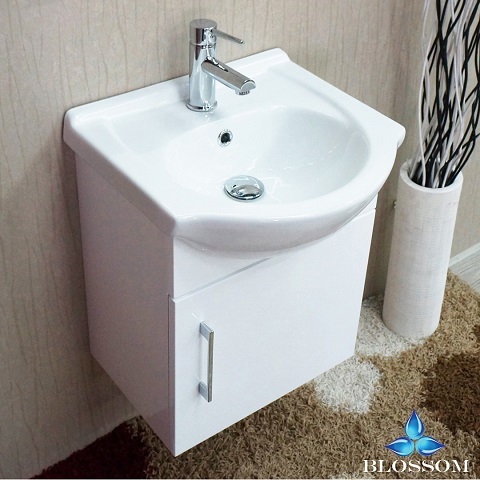 Space saving vanities, on the other hand, can clock in at as little as 10″ deep, sitting flat enough against your wall to allow passage even in the tightest space. The obvious drawback here is that a vanity that small doesn’t really give you much to work with. The cabinets are necessarily small, which means less storage than you might hope for. The cabinets are also almost invariably simple ones, too, with none of the fancy drawers or cubbies you might find on larger space saving vanities. That said, absolutely all the space inside the cabinet is open for use, with no faux-drawers or panels blocking off precious storage space. Another common quirk among these shallow, space saving vanities is that the faucets are often offset; they shift the faucet assembly to one side of the vanity or the other rather than putting it against the wall. This change is what allows most of these vanities to be so trim: by relocating the faucet, the whole vanity can be pushed closer to the wall. The new placement means the faucet still has the full width of the sink to catch water (so you don’t have to worry about splashing), but allows the sink itself to be condensed into a compact rectangle. 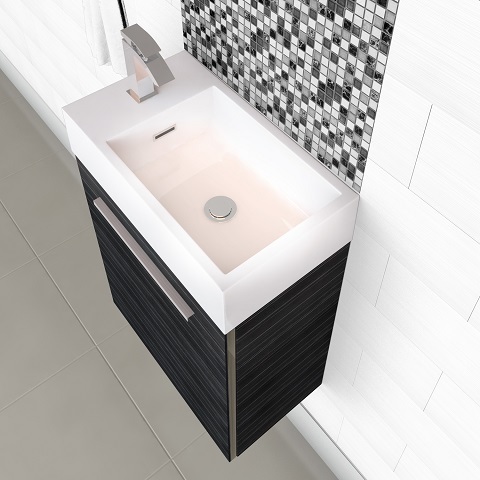 If you really don’t like the look of these compact sinks (or if you just cant get used to the offset faucet), there are lots of space saving vanities that take a slightly different approach. Rather than rearranging the sink and faucet to shrink them both, these alternate designs keep a nearly full-sized sink attached to the scaled-down cabinet, creating apron-like sinks that have a subtle cottage feel to them. These larger, curved sinks do increase the footprint of the vanity somewhat, but because they’re lean rather than bulky, they’re easier to move around than a full sized vanity, which makes them an effective way to get a larger sink in a very small bathroom. It’s worth noting, too, that wider sinks can be more or less subtle. 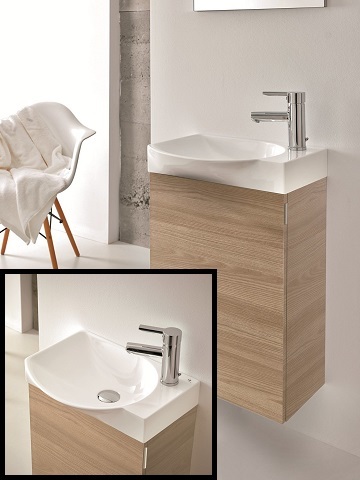 While many of them have that iconic curvy front apron that’s reminiscent of pedestal sinks, it’s possible to find sleeker, more modern variants where the sink widens only ever so slightly, giving you a little more room in the basin without significantly changing the appearance (or footprint) of your space saving vanity. 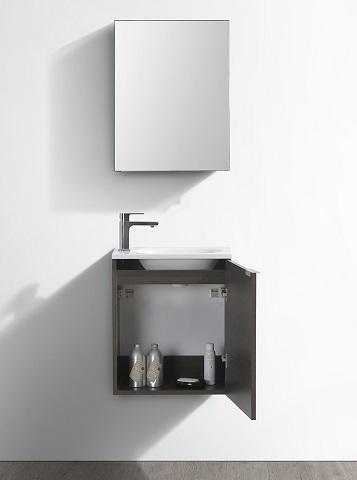 Regardless of the shape of the sink, it’s also important to keep in mind that the plumbing will need to fit inside the cabinet as well – a detail that many manufacturers conveniently leave out of their product photos, but that definitely has an impact on the amount of available storage space. The other major drawback to having a sink and vanity this small is that you really don’t have any counter space to speak of. What little room there is is taken up almost entirely by your faucet, which means these super small bathroom vanities don’t leave you room enough even to store your toothbrush out in the open. The small size and accessibility of the vanity cabinet can help make up for this somewhat, but be aware you might need to get a little creative, with things like wall-mounted toothbrush holders and soap dishes, if you plan to use the space as more than just a guest bathroom. Making a very small half bathroom is definitely a challenge, but with the right tools, it isn’t impossible. 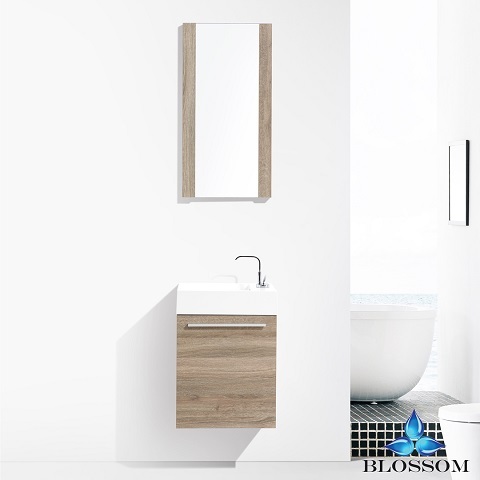 Streamlined, scaled down, space saving vanities emphasize compact efficiency and can help you make the most of even the smallest bathroom. This entry was posted in Bathroom, Bathroom Sinks, Bathroom Vanities, Decorating Ideas and Tips and tagged efficiency bathroom vanities, Small Bathroom Design, Small Bathroom Ideas, Small bathroom vanities, space saving bathroom vanities, space saving vanities, Wall mounted bathroom vanities.